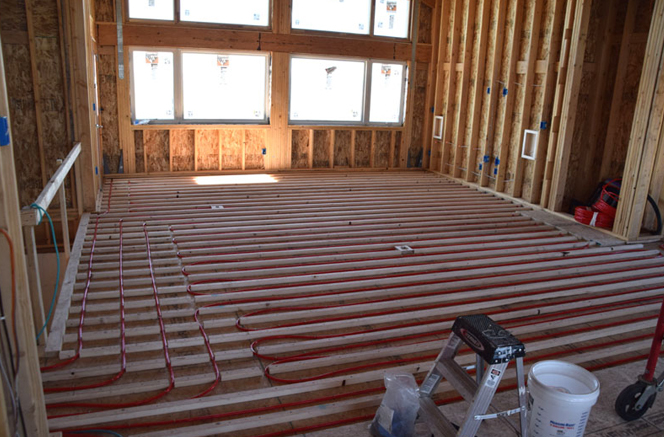 Installing a hydronic radiant heating system may be easier than you think. 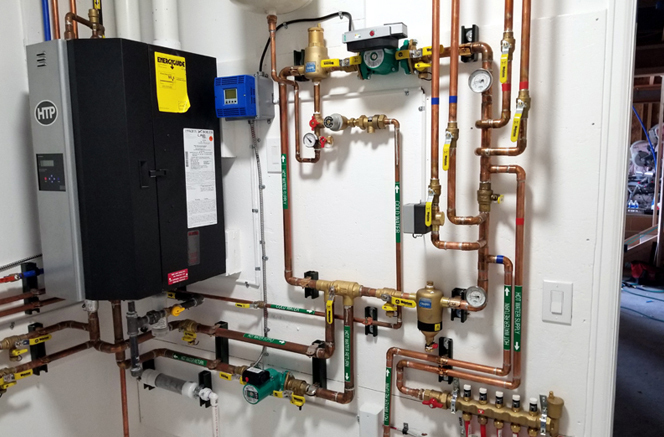 Infloor Heating Systems has been taking great strides to reduce the complexity of these systems and make installations quicker and easier than ever before, for everyone. Hi Valley Supply recently sold an entire Infloor system as one unit to customers who decided to tackle the installation themselves. And with our guidance, designs, and dedicated support, even first-time installations can be flawless. They decided on a raised ranch, with no fillers, around 2,800 sq. ft. with a basement, where there is also a two car garage. The footers are sitting directly on a rock bed that the Dreher’s jack hammered out by hand. They even built the kitchen cabinets themselves with furniture-grade plywood, citing that they don’t care much for particle board, and that it saved them a lot of money. 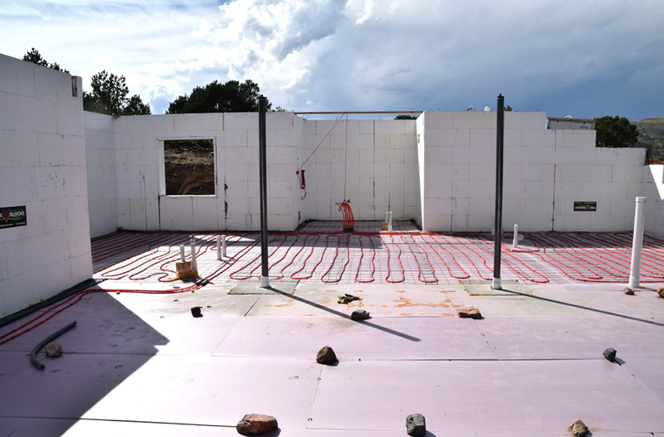 The entire house, minus the garage, is heated by a hydronic radiant heating system. It was designed for a 70 degree indoor temperature at 0 degrees outdoor temperature. 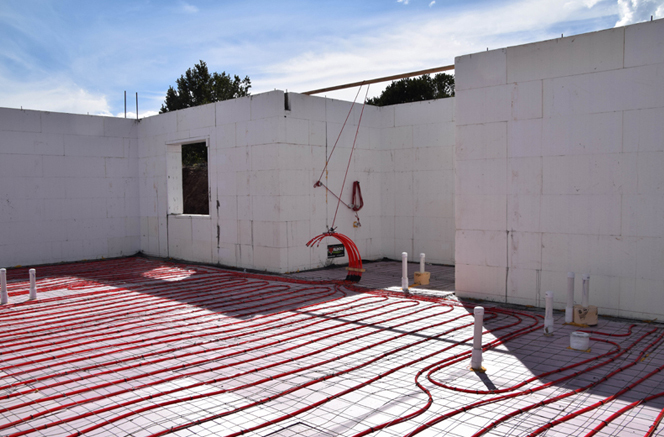 There are seven (7) zones of heating separated into four (4) zones of concrete, three (3) zones of gypcrete, and one (1) zone for domestic hot water. All the zones are equipped with a thermostat. 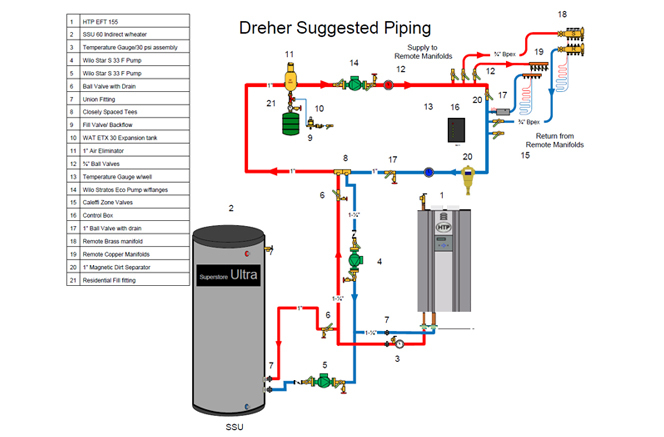 Both copper (upstairs) and brass (downstairs) manifolds were used with ½” BPEX tubing, placed 9″ on center. 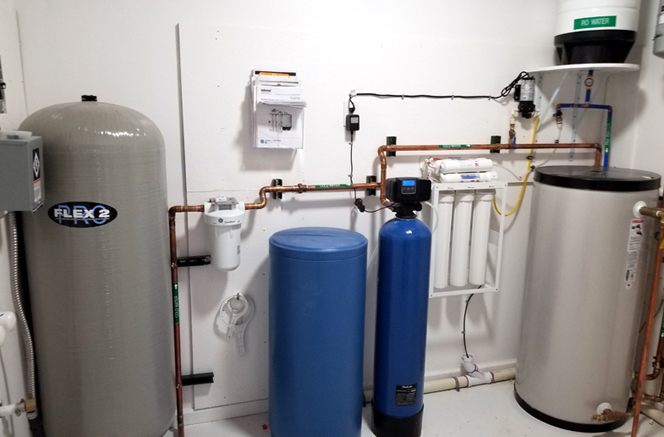 The system is heated by an HTP Elite Fire Tube 155 boiler to adequately recover the 60 gallon tank and provide the largest range of modulation. The massive master bedroom is 450 sq. ft. with high, vaulted ceilings, and carpet as the floor covering. 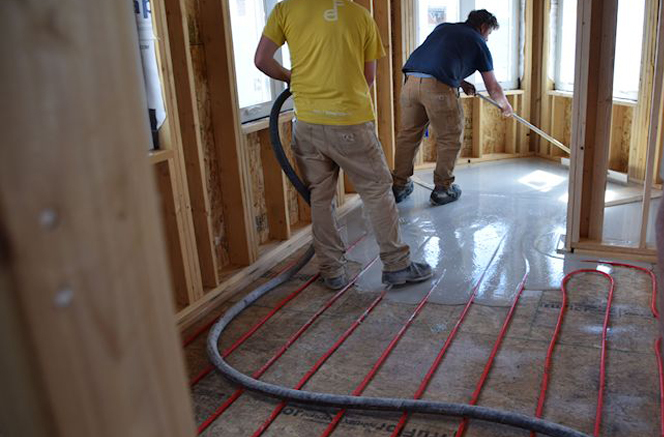 The rooms with hardwood flooring have sleepers installed making installation easier by nailing the hardwood directly to the sleepers, while keeping the PEX tubing safe and sound. Conrad took on the installation of the mechanical room with the desire to learn as he went. “I laid it all out in the room, consulted the control loop diagrams provided, and figured it out. I was sure to place components where they could be easily accessed,” said Conrad. 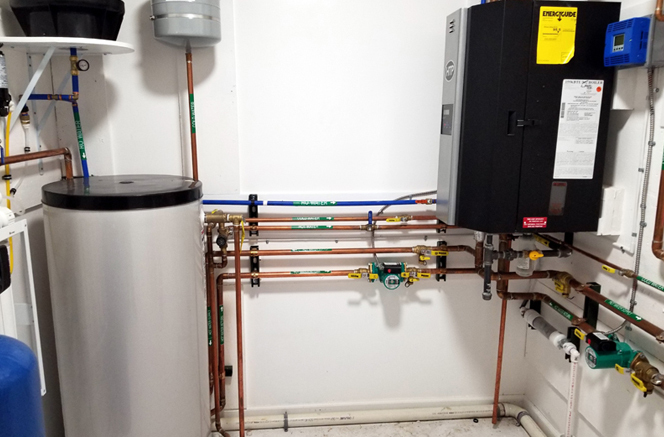 The project design was provided by Infloor Heating Systems, and then the customer chose to handle the installation and assemble the mechanical room themselves. “They got everything they needed at one time – all as one system, including all the parts, fittings, design, and diagrams,” he said. Which was very appealing to the Dreher’s. 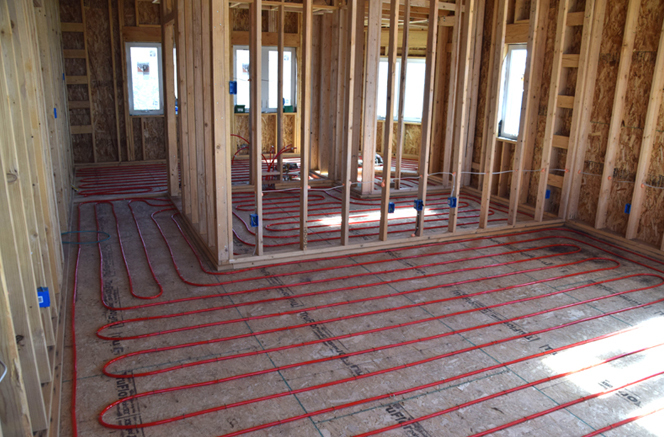 “I liked the way Infloor packaged the system, complete with everything I needed for the installation,” said Conrad. “I told Michael what I wanted, and they nailed it. I installed the system just the way they sent it to me. And when I had questions it was nice to know that I could call them anytime and get answers on things. They are happy to hear from you when you call. It was a great experience, and with no problems at all,” he said. “Michael and Tim really know their stuff, inside and out. I don’t know of anyone who does it better,” Conrad concluded.